My friend did not know how to transfer data from Android to iPhone and he came to me to ask for help. I recommend him use Move to iOS for iPhone or Leawo iTransfer to solve this problem. Move to iOS for iPhone can offer you much convenience when you want to switch from Android to iPhone. Leawo iTransfer enables you to deal with diverse transfer issues accurately and safely. Now I would like to show you how to make it. The detailed contents are as follows. Move to iOS app for iPhone is a product of Apple Company, which can be used to transfer files from Android to iPhone directly, such as music, notes, movies and so on. This app enables you to switch from Android to iPhone without any difficulty. The following contents will instruct you to use this great software to realize your goal with iPhone Move to iOS app. 1. First you need to search Move to iOS for iPhone in the Google Play Store and then download it to install onto your Android and iPhone. Afterwards, you need to run Move to iOS on iPhone. Swipe upwards to make sure your iPhone is connected to good Wi-Fi network to prepare to use iPhone Move to iOS app to solve the problem. 2. On your Android, you also need to run Move to iOS application. After that, you need to check the file categories that you would like to transfer from Android to iPhone, such as messages, contacts, bookmarks and so on. You also need to ensure that your Android is connected to Wi-Fi network to enable you to transfer files from Android to iPhone with Move to iOS app for iPhone and for Android. 3. When the transfer process begins, you should make sure you do not switch to other applications or turn off this device until the transfer is complete. Wait until the process comes to an end. Finally, you can solve how to transfer data from Android to iPhone with Move to iOS for iPhone and for Android. This method to use Move to iOS on iPhone and on Android is quite easy to handle. You just need to connect both devices with Wi-Fi network and run the app on both devices to choose the files you need to transfer. If you want to transfer Android to iPhone more accurate, you can continue to read the following contents to know how to make it without iPhone Move to iOS app but Leawo iTransfer. Although Move to iOS on iPhone and on Android is simple to deal with your problem, you can not choose the specific files that you want to transfer from Android to iPhone. As for this shortcoming of Move to iOS app for iPhone and for Android, you can take advantage of Leawo iTransfer to assist you. It can help you to manage up to 12 kinds of files among computers, iDevices and iTunes. Here I would like to take videos for instance to show you how to transfer form Android to iPhone without Move to iOS app for iPhone but Leawo iTransfer. On PC, you need to launch Leawo iTransfer and then use a proper USB cable to connect both iPhone and Android to your computer to prepare to move files from Android to iPhone without Move to iOS on iPhone but Leawo iTransfer. 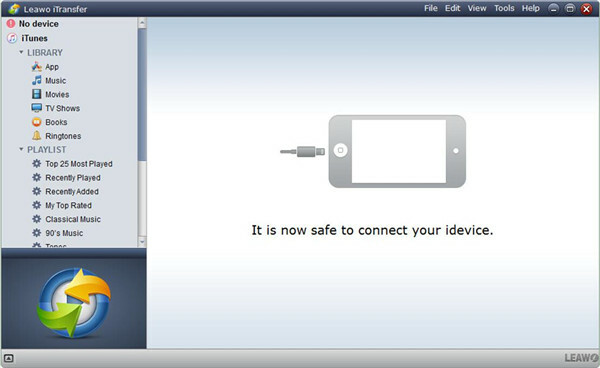 Your iPhone information will show in the main interface of this software. Click on the iPhone icon and then move to “LIBRARY > Movies” panel to check all videos on your iPhone. Afterwards, you need to click on the “Add” button to navigate to your Android storage folder to choose the files you want to transfer to iPhone. Click on “Open” to begin to move files from Android to iPhone. This process will take you a few seconds. Wait until this process is over, the Android data will on your iPhone. Thus the problem of how to transfer data from Android to iPhone can be solved perfectly and effectively. You can also use this program to transfer other files from Android to iPhone by clicking on the corresponding category under the menu of “LIBRARY”, such as books, ringtones, bookmarks and so on. Compared with Move to iOS for iPhone, this software is more professional and accurate. It has more powerful functions than Move to iOS app for iPhone. Have a try and you will know how amazing it is.